Housing affordability in Australia has become a critical concern for young would-be homeowners and policy-makers alike. It has been the focus of a large body of research in Australia, and as house prices increase rapidly, has increasingly become a contentious political concern. Yet, despite the rhetoric emerging from various groups around housing affordability, little in the way of a coherent policy agenda to address housing affordability has emerged. Professor Chris Pettit and his colleagues at the City Futures Research Centre (CFRC) recently undertook a comprehensive analysis of housing affordability, powered by the AURIN portal. The authors used multiple datasets to unpack housing affordability in Sydney in a way that illustrated both the spatial and temporal variations, for both the rental and ownership housing tenure types. As part of their research outcomes, they were able to take a city wide metric (the oft-used Demografia Affordability Index), and “localise” it, providing a more fine-grained picture of how housing affordability may vary across the city. 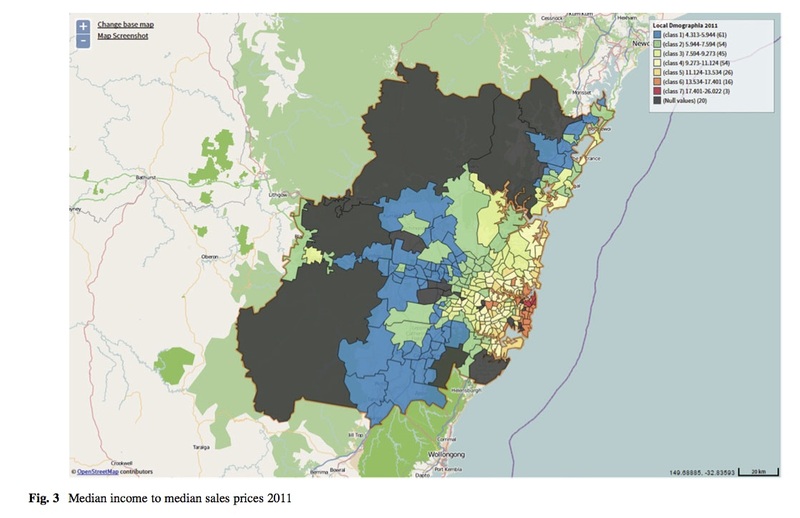 This showed that the least affordable houses were located in the Eastern suburbs of Sydney, with affordability increasing further towards the West. However, they also showed that the western suburbs had the highest rent to income ratios, indicating that households in those areas may be experiencing significant levels of rental stress. Overall, Prof. Pettit and his co-authors illustrated that housing affordability is complex and multi-faceted, especially when considering how it may vary across a city, over time, and across different housing markets. Prof. Pettit and his colleagues used the AURIN portal for much of their research. Crucially, they were able to draw on a wide variety of high quality, finely resolved datasets available through the portal at the time of their research to provide a nuanced picture of the housing affordability issue in Sydney. Central to their analyses were the Australian Property Monitor (APM) individual house sale records, ABS census data, and NSW Rental Bond Board Data. The AURIN portal was uniquely placed to bring these authoritative datasets from multiple data providers together in a securitised framework, allowing a detailed understanding of the multiple dimensions of housing affordability that can only arise from the integration of multiple sources of information. In addition to acting as a provider of these datasets, the AURIN Portal’s analytical tool kit was used extensively in this research. The authors were able to undertake basic exploratory analytics, including scatterplots and mapping of data (as shown below), as well as more complex spatial-statistical routines such as Getis-Ord G* clustering algorithms. Importantly, because the AURIN acts as an open, interoperable system, the authors were able to download and manipulate data in complementary software platforms, before uploading their new datasets again and continuing on with their analyses. The AURIN portal’s ability to act within an eResearch ecosystem is central to allowing this kind of integrated, open research.